Antigone stiffened. Over Ryder’s shoulder, she saw what could only be Hector Bob sauntering across the railroad tracks toward them. She caught her breath and clutched her stomach. Ryder’s head whipped around. Hector Bob was lanky and tall, his ill-fitting white summer suit hanging on him in a jaunty manner. 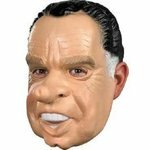 He wore no tie, just a ribbon-collar shirt buttoned up all the way to his Richard Nixon Halloween mask. He reached the car, leaned against the convertible on Ryder’s side, and examined his fingernails. The alley just got quieter and creepier. Antigone searched the dark doorways of the abandoned buildings. Ryder edged closer to her, ready to spring if Hector Bob made a move toward her. “Thanks,” Antigone said, wishing she were anywhere but here, wishing they were tooling down some wide open road. Her insides felt like a bowl of Cream of Wheat that had been sitting too long, full of lumps. Antigone patted an envelope lying between the seats on the gearshift. They exchanged envelopes, leaning across Ryder, careful not to touch fingers in passing. Hector Bob counted the money twice. Antigone took her time examining the fake birth certificate, pretending that she dealt in false credentials all the time.